Beginning Monday, April 9, Secaucus Middle and Secaucus High School students will have the option to purchase a Grab-n-Go Breakfast, located in the hallway outside of the Lower PAC. All students will be offered a complete meal. 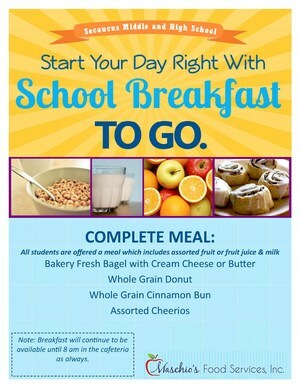 Breakfast will continue to be available until 8am in the cafeteria as always.